Early Jewish history in Austria is fragmentary, but dates back to the Roman Empire, when Jews arrived in the region with the Roman legions. Today, the Jewish population in Austria is approximately 9,000 people. Early Jewish history in Austria is fragmentary, but dates back to the Roman Empire, when Jews arrived in the region with the Roman legions. After the decay of the Roman Empire, the next record of the presence of a Jew in Austria is found in the ninth century, when Bishop Arno of Salzburg (785-871) was treated by a Jewish doctor (“medicum iudaicum”). The “Raffelstettener Zollordnung” (a catalogue of customs and tax rules from 903-906 CE) documents the presence of Jewish merchants in Austria in the 10th century. During the reign of Frederick I of Babenberg (1195-98) there was an influx of Jews from Bavaria and the Rhineland. In 1244 the Duke of Austria, Emperor Friedrich II, granted Jews certain rights. Thus, during the thirteenth century, Austria became a center of Jewish learning and leadership for the German and western Slavic lands. During this time Jews held important governmental positions, administering taxes and mints. They were also very involved in trade. Immigration from Germany increased in the second half of the thirteenth century, and Jews began to encounter growing hostility fostered by the church. A fixed Jewish tax is mentioned in government records for the first time in 1320, and, soon after, massacres of Jews occurred. In 1338, Jews were granted formal rights, but it was also in this year that the massacre of the Jews in Pulkau occurred. In response to the events in Pulkau, the Viennese Jews lowered interests for loans in order to prevent similar actions against their own community. The position of the Jews became increasingly precarious during the reigns of Albert III and Leopold III in the mid-1300's through the early 1400's. With the increasing power of reformist movements and the related loss of power for the Catholic Church, hostility against Jews increased; being non-Catholic, they were often seen as collaborators of anti-imperial, protestant forces. Cancellation of debts owed to Jews, confiscations of their property, and economic restrictions multiplied. In 1420, King Albert V ordered the arrest of all Jews, and 270 were burnt at the strake, the rest were expelled and their property confiscated. Under Frederick III (1440-93), however, their position improved; with papal consent he gave protection to Jewish refugees and permitted them to settle in the towns of Styria and Carinthia. Emperor Maximilian I banned Jews from Styria and Carinthia on request of local guilds in 1496, at which time the Jews relocated to the Eastern edge of the Empire in Zistersdorf near Eisenstadt. Starting in 1551, Jews had to wear a yellow spot on their clothing every time they entered market towns or cities. Still all in all, Jews experienced less discrimination throughout the sixteenth and early seventeenth centuries. The number of Jews in Vienna consistently increased throughout the sixteenth century and a new cemetery was built in what is today’s 9th district. In 1624, Jews were allowed to settle in the area of today’s Leopoldstadt under the rule of Emperor Ferdinand II. In 1669 a commission was appointed by the King, in which Bishop Count Kollonch urged the expulsion of the Jews from Austria. This edict of expulsion remained in force until 1848; however, a number of court Jews were permitted to remain with their families and servants. As early as ten years after the edict of 1669, individual Jews were granted permission to return to Austria. Samuel Oppenheimer and Samson Wertheimer acted as Court Jews (“Hofjuden”), gaining influential positions and significant privileges. In 1752, there were an estimated 454 Jews living in Vienna, all of whom were connected with twelve prominent families. In 1727, to limit the Jewish population, laws were introduced permitting only the oldest son of a Jewish family to marry. With the end of the counter-revolution and the gradual settling of religious wars between Catholic-Imperial and Protestant-Federalist forces, the situation for non-Catholic people in Austria gradually improved. The spreading ideas of enlightenment helped to secure basic rights for Jews. The “Toleranzpatente” of Emperor Joseph II in the 1780s was the first official guarantee of basic religious freedom. By then, the segregated Jewish districts of the Habsburg Empire (called “ghettos”) hosted 1.5 million Jews. The “Toleranzpatente” was mostly issued for the sake of Protestants and Greek-Orthodox Christians (about one third of the Empire's population), but Jews were also admitted to public schools (compulsory education was introduced by Empress Maria Theresia, Joseph’s mother), universities, the military and all crafts and agriculture. The declared aim of this was to increase the contribution of Jews to the public. However, they faced strong opposition from the traditional guilds that fought this new competition. Jews remained active primarily in trade and the slow acquisition of capital led later to significant success of Jewish investors in the cloth and cotton industries of Bohemia and Moravia. Established Jewish bankers (such as the originally Viennese Rothschild family) used the new freedom to expand their businesses into other sectors. Still, immigration and ownership of land remained prohibited for Jews. Thus, this and other constraints prevented Jews from having full citizenship rights. Nevertheless, based on their new rights and assimilation (which was later accelerated through the spreading ideas of the French Revolution and the following Napoleonic Wars), several Jewish families in Vienna acquired significant wealth and politically influential positions. Not surprisingly, many of them promoted progressive ideas of equality and enlightenment. That didn’t really help to foster appreciation for Jews: Since the Catholic Habsburgs ruled as absolute monarchs over a multiethnic empire, they were not very fond of any nationalist, republican, libertarian or anti-clerical ideas of the French Revolution. Many Jews were progressive freemasons, which fostered hostilities from military, nobility and clerics even more. The Jew Johann Emanuel Veith converted to Catholicism and became court preacher in Vienna’s Stephansdom cathedral. He maintained close ties with the Jewish community and actively fought anti-Semitic actions. After the death of Joseph II many of the restrictions against Jews were re-introduced, forcing Jewish children to attend Christian schools and only permitting prayer in “the language of the state.” Still, the Jewish population steadily increased. In Vienna, the Jewish population rose from about 500-600 in 1800, to 4,000 in 1848, when the revolution broke out. Many Jewish intellectuals joined the revolutionary forces (consisting mostly of liberal students and nationalists). The “Pillersdorf constitution” of 1848 granted full civil rights and religious freedom to all religious groups of the Empire. Following the 1848 revolution, a number of Jews were elected to the Parliament. The Jewish tax was removed, as were the restrictive marriage laws. The constitution of 1849 abrogated discrimination on the basis of religion. Despite this step forward, Jews were required to obtain special marriage licenses, even if the number of marriages was no longer limited. The new Emperor, Franz Joseph I, however, took back many of the rights that had recently been granted to the Jews. Jewish civil servants were inaugurated to prove their loyalty to Austria (1851); they were excluded from the possession of land (1853); and they were excluded from certain professions such as soliciting or teaching (1855). Many intellectual Jews went into publishing since it was permitted. This led to a division of the press into an “old order” branch (pro Habsburg, Catholicism, monarchy) and a “progressive” branch (anti-Habsburg, secular, republican); the first one anti-Semitic, the latter one influenced by the many Jewish journalists. It seems that at this time the Jewish culture in Vienna started to bloom and develop its own identity. The traditional Ashkenazi rite to celebrate a service was adapted in Vienna to a “Wiener Ritus” (Viennese rite), which spread over the Empire to Bohemia and Galicia. Yiddish lost importance in Vienna, partly also in Bohemia and Moravia, and was increasingly replaced by German. In 1858, the synagogue of Vienna was built, one of the most elaborate in Europe. With the “Ausgleich” between Austria and Hungary in 1867, Jews finally gained full citizen rights. Vienna was now the city in the Habsburg Empire with the largest Jewish community (40,000 or 6,6 percent). Most of the Viennese Jews were of Bohemian, Moravian and Hungarian origin, while others were from the poor area of Galicia. Jewish communities in other parts of the Empire developed, even in cities that have not had any Jews for a long time, such as Salzburg (part of Austria since 1816). One thing that looks extremely odd today in the light of history was the alliance between German nationalists and many Jews: Liberals of 19th-century Austria were often driven by the ideas of freedom, equality and nationhood derived from the enlightenment and romanticism. Nationalists were often anti-cleric, anti-Habsburg and in favour of a big, German republic (including the German speaking parts of Austria-Hungary). Their liberal ideals appealed to many Jewish intellectuals. Over the course of the 19th century, progressive nationalists increasingly endorsed anti-Semitic thoughts. They were concentrated around nationalist “Burschenschaften” (fraternities) and the “Turnerbund” (a sport association). At a time when more and more Jews intermarried with non-Jewish Austrians, didn’t speak Hebrew or Yiddish and stopped practicing any faith, a counter-movement based on anti-assimilation thoughts developed, in strong correlation with German nationalism. Spearheaded by people like Theodor Herzl, a Jewish-National Party was formed and a Jewish Fraternity (“Kadimah”) was founded in 1882. As Zionists they worked towards the foundation of a Jewish nation. Herzl himself had been a member of a German-nationalist fraternity, which later, after Herzl had already quit his membership, formally excluded Jews and endorsed an openly anti-Semitic policy. Note also that the National socialists relied partly on the ideological basis of the 19th century nationalists, but were primarily a street-movement of soldiers and the unemployed in their early days. Many members of Turnerbund groups and Burschenschaften became leading Nazis, but the organizations were dissolved in Nazi-Germany (like all societies). Within the Jewish community of Austria, a conflict between right-wing Zionists and pro-assimilation groups developed. Many socialists of that time were Jewish, too, for example Victor Adler and Otto Bauer (or Karl Marx in Germany). During the First World War, 36,000 Jews from Galicia moved to Vienna. A total of 200,000 Jews lived in the new, tiny Austria. Eastern-European Jews were generally much more conservative (and Yiddish speaking) than the assimilated, wealthy Jews of Vienna, and tensions increased. So did anti-Semitism, and the fact that ten thousands unemployed former soldiers now populated Vienna and looked for scapegoats did not help to improve the situation (Adolph Hitler worked as an “artist” in Vienna at this time). In 1918 there were 300,000 Jews in thirty-three communities within Austria, with 200,000 living in Vienna. The Treaty of St. Germain (1919) following World War I guaranteed the Jews minority rights, and Zionist Robert Stricker was elected to the Vienna city parliament. In the period of 1919-1934, Jewish schools and Hebrew classes opened their doors, and the Zionist organizations flourished. 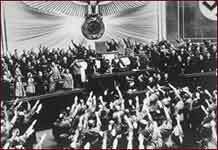 The persecution of Austrian Jewry began with the Anschluss by Nazi Germany on March 13, 1938. At the time, there were 200,000 people living in Austria (180,000 in Vienna) that were classified as being Jewish according to the Nuremberg Laws of Nazi-Germany (full, half, quarter, or eight-Jewish). The Nazi regime immediately perpetrated acts of violence against the Jewish community throughout Austria. At first, systematic terrorization occurred mainly against property owning Jews and the intelligentsia. Street attacks and brutal persecution became daily occurrences. In May 1938, the Viennese Jewish community was permitted by the Nazis to organize mass emigration movements. Between July and September 1938 emigration reached a monthly average of 8,600. In October 1938, Nazi riots broke out and Hitler gave instructions for the deportation of 27,000 Viennese Jews. During the pogroms of November, including Kristallnacht, approximately 8,000 Jews were arrested, and 5,000 of them sent to Dachau. In Vienna alone, forty-two synagogues were burned and 4,038 Jewish shops were looted. During the first four months of the war, 11,240 Jews succeeded in immigrating to neutral countries. In October through November of 1941, 5,486 Jews were deported to the Lodz Ghetto. After the official prohibition on emigration in 1941, about 40,000 Austrian Jews remained. Of the 128,500 who had emigrated, 30,800 had gone to England, 24,600 to other European countries, 28,600 to the United States, 9,200 to Palestine, and 39,300 to fifty-four other countries. At the end of 1941, 3,000 Austrian Jews were deported to the ghettos of Riga, Minsk, and Kovno. Between June and October 1942, 13,900 people were deported to Theresienstadt. The Viennese Jewish community was officially dissolved on November 1, 1942. In the summer of 1943, there were approximately 800 Jews left in Vienna, but they had gone underground and were secretly hidden by members of the community. One of the largest and most terrible concentration camps, Mauthausen, was situated in Austria. The Mauthausen camp was the central camp (referred to as the “mother camp” by the SS guards) for all of Austria. Forty-nine permanent subcamps, as well as some temporary ones that existed only for a few weeks, were administered from the Mauthausen camp. Until 1939, most of the prisoners were put to work building the camp and the living quarters for SS troops. Later on, they were sent to work in the quarries. Starting in 1943, prisoners were also allocated to the armaments industry, with prisoners from Mauthausen working in almost all the larger arms factories in Austria. Of the approximately 50,000 Jews deported from Austria to ghettos and camps only 1,747 returned to Austria at the end of the war. Another 20,000 Austrian Jews were killed after immigrating to other European countries, which eventually fell under Nazi rule. The number of Austrian Jews who perished in the Holocaust is estimated at 70,000. After the war, there were many displaced people in Austria, some returned to their homes, but many immigrated to Israel after its formation in 1948. A small community did establish itself in Vienna and, in 1968, there was a small Jewish day school, a Jewish hospital, and an elderly home. After the formation of Israel, Austria sought diplomatic relations with the State, and although somewhat tense at first, Austria's support for Israel in the Six Day War of 1967 helped strengthen ties. Today Austria has approximately 7,400 Jews of whom about 800 lived in Vienna before 1938, 1,500 are Soviet immigrants, and the rest are from other Eastern European countries. In July 1991, the Austrian government composed a statement acknowledging Austria's participation in the crimes of the Third Reich. 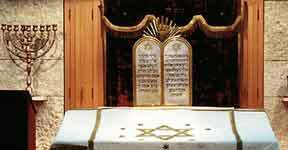 In March 1993, the synagogue in Innsbruck, Tyrol, which had been destroyed in 1938, was reopened. 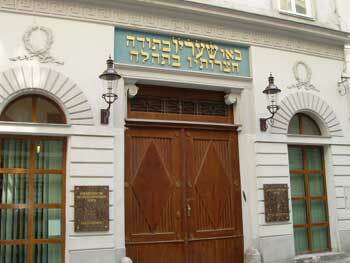 In 1994, the library of the Vienna Jewish community was re-opened. In May 1995, the Reform Jewish congregation Ohr Chadash celebrated its fifth anniversary. Unfortunately, neo-Nazi and anti-Semitic activity remains a problem in Austria. Several letter bombs were sent to political officials and journalists who were working with Jewish communities in the early 1990's, and several anti-Semitic journals and politicians still voice their Nazi sympathies on occasion. The Austrian government has been slow and hesitant to pay adequate compensation to survivors of the Holocaust, and the details of compensation are still in dispute. In November 1993, the Jewish Museum of the city of Vienna was opened in the historic Palais Eskeles in the heart of the city of Vienna. The museum contains collections on the history of Jews in Vienna, and all of Austria, as well as an extensive collection of Judaica. The Museum Judenplatz in Vienna opened in October of 2000 and is the national memorial to the Austrian Jewish victims of the Holocaust. The Sigmund Freud Museum in Vienna is located where Freud had his office and residence. The museum has original documents by Freud in addition to amamteur films of his family and personal life compiled by his daughter Anna. After a 2017 election which brought far-right groups with anti-Semitic roots to power in Austria's governing coalition, the government announced confidence-building steps aimed at improving relations with Israel and the Jewish people. On December 20, 2017, the Austrian governing coalition announced plans to grant citizenship to the approximately 200,000 descendants and relatives of Austrian victims of the Holocaust.